Now on Kickstarter is the first expansion for last year’s Spiel des Jahres nominee Luxor. What makes the pyramid exploration game great is its simplicity while still forcing players to make interesting decisions. The Mummy’s Curse will keep it simple, but four of it’s five modules will add new twists to consider. A mummy walking around putting explorers to sleep, special starting cards, a new kind of treasure, and eight player boards with different special abilities. The fifth expansion module has components for a fifth player. 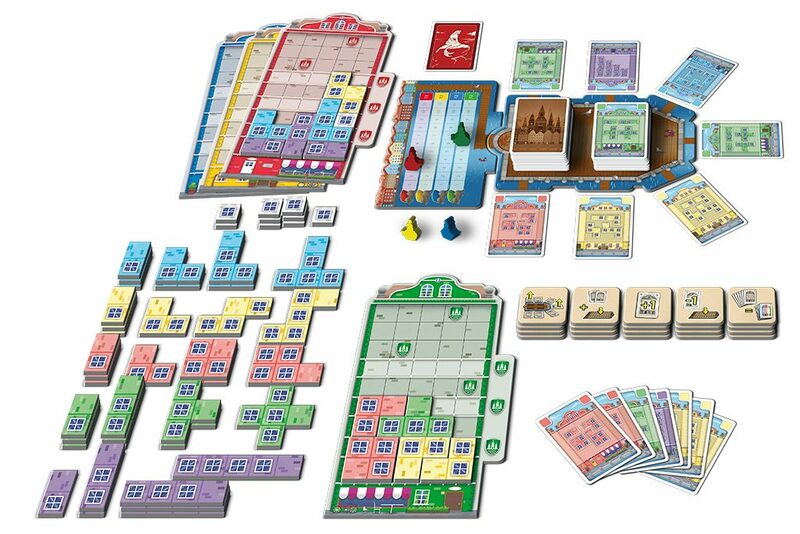 Also coming from Queen Games is the family game Copenhagen. Despite the name it only concerns itself with one neighborhood of the Danish capital. Nyhavn is famous for its beautiful, colorful houses along the waterfront, and players in Copenhagen will construct facades just like these. You acquire the vaguely Tetris-like facade tiles in sets from cards on display. Making the game interesting are special abilities that you acquire covering certain spots on your player board to help you for the rest of the game. It’s been 120 years since H.G. Wells published War of the Worlds, one of the earliest stories about aliens invading Earth. What no one knew in all this time: The Martians came back once more, and that time they’d taken their flu shots. In Grey Fox Games’s War of the Worlds: The New Wave the invaders return to England some years after their first attempt. Only annihilation of the enemy will do in the asymmetric two player deck-building game. For the Martians that means eliminating the British population. For the Brits, doing thirty points of damage to their opponents, destroying their invasion force. If two player asymmetric deck-building makes you think of A Few Acres of Snow that makes at least two of us. Those are big boots to fill, but The New Wave has the potential for it. Schmidt Spiele presented their spring line-up, and 2019 is going to be the Year of the Warsch. Wolfgang Warsch, who made his debut as a game author last year with three nominations to (Kenner)Spiel des Jahres, is in the catalog with three entries. 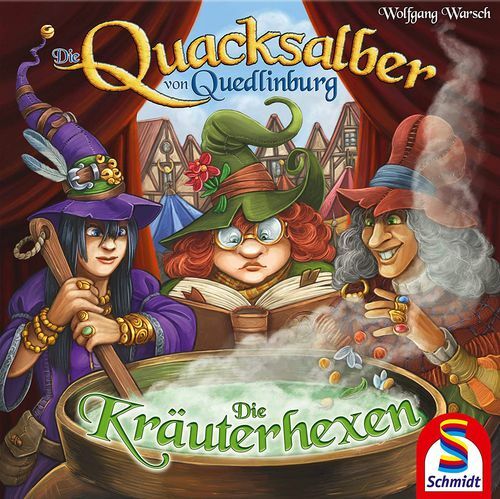 The first was very much expected, an expansion to Kennerspiel des Jahres 2018 The Quacks of Quedlinburg. With Die Kräuterhexen (translates to something like The Herb Hags) you will get a new ingredient for your potions, new recipes to use them, and the titular witches, with no information yet what they will bring to the game. The new big box game from Wolfgang Warsch is Die Tavernen im Tiefen Thal (The Taverns in the Deep Valley). In this game players will pick dice and build their personal deck to expand their own tavern in the deep valley, attract wealthy guests and try to make a profit. It sounds especially interesting that each player will be able to pick their own level of difficulty. Finally, there is Doppelt So Clever (translates to Twice As Clever), a sequel to Ganz Schön Clever. It will also be a roll-and-write game with basic rules similar to Ganz Schön Clever but new options what you do with those dice. That’s all from Wolfgang Warsch, but not all the exciting new games from Schmidt Spiele. With Dizzle there is another roll-and-write game in their lineup, this one by Ralf zur Linde. Players will take turn drafting dice to put on their score card, but they may only continue while they can place dice adjacent to ones they have. I imagine kicking your opponents out of the round early will be a big part of the game. And then there is Overload, a racing game by Wolfgang Riedl. It’s not so much about speed, though, it’s about bringing discs across the finish line. You choose how many of them you carry at the start. Every time another player passes you, you add another one. That sounds nice, but if you collect too many discs you spin out of control and must restart the lap. Tsuro, the popular path-building game, makes a return, and Tsuro: Phoenix Rising has all new mechanics that will make the new game exciting for old fans. It will also make the game more difficult, with more options to consider for your turn. The players, in the role of the phoenixes, must collect seven lanterns. Placing tiles to extend their path is still part of the game, of course, but in Phoenix Rising those tiles can also be turned and flipped to get you where you want to go. That adds a lot more options to consider. Also, if you’ve played other games where you flip tiles from the middle of the grid you’ll really appreciate the special tray that lets you pick up tiles without moving all the others. Running the equipment shop in a typical fantasy role-playing game is a tough job already. All those heroes looking for exactly the right weapon, and if you don’t have it right their on the shelf they take their gold somewhere else. Bargain Quest has taught us it’s a tough life, and it’s about to get tougher. 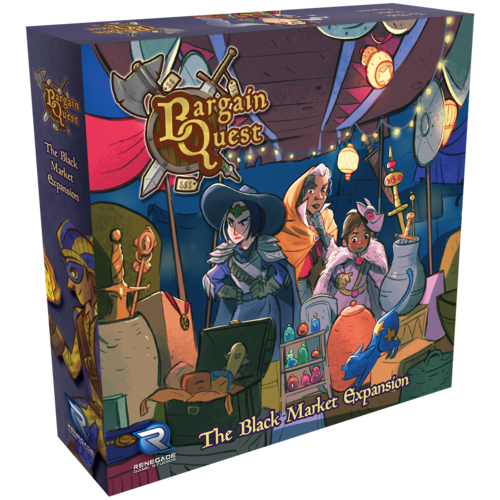 In Bargain Quest: The Black Market Expansion you’ll have to enter into more unsavory dealings to turn a profit. And the black market isn’t all, there are also new heroes looking for new weapons and new employees ready to trash your opponents’ stores. Ninjas are often depicted in media as action superheroes. Fast, strong, completely invisible, masters of all weapons. But it’s something else that decides over success or failure for a stealthy spy and assassin: proper planning. That’s the focus of Shadow Tactics. Up to five ninjas, each with a different skill set, plan five actions per round to infiltrate the daimyo’s castle and complete their mission. The daimyo controls his castle guards and tries to eliminate the ninjas before they reach their goal – if he can see them at all. The missions chain together into a campaign structure where all parties get to upgrade their characters between games and the difficulty changes depending on the outcome of the previous missions. Warhammer and Warhammer 40.000 have recently spread out more and more from their miniature skirmish game roots into other forms of tabletop games. The latest of these is Warhammer: Age of Sigmar – The Rise and Fall of Anvalor. The full title is a mouthful. While superficially you work to defend the city of Anvalor against invading enemies, your real goal is a different one. You want to use your defensive projects to gain influence and end up controlling the city. To that end you build your own factions buildings on the city grid and try to get the killing blow on invaders after the other players weakened them. The Rise and Fall of Anvalor will have six player factions, each with four different aspects – whatever that may mean – and three enemy factions with four levels of difficulty each. There will also be four game modes beyond the standard style of playing, so this game will keep you busy exploring options. Like them or not, boardgames with app integration are here to stay. 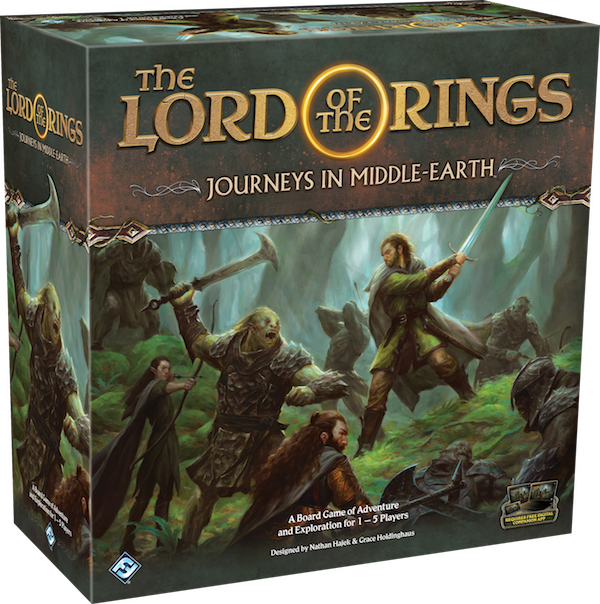 The next big – really big – example of those will be The Lord of the Rings: Journeys in Middle-Earth by Fantasy Flight Games. Up to five players travel around Middle-Earth, explore mysterious places, have adventures and kill monsters. The app reveals what places they find and controls their adversaries. The basic concept is pretty close to Mansion of Madness because, let’s face it, it’s a solid approach to a game where explore and fight monsters. It sounds like Journeys in Middle-Earth will be even bigger than Mansions of Madness because you’ll have adventures on two entirely different scales, using different tiles. On the journey map you travel long distances, discover cities, explore dark forests. When things get more focused on combat you switch to the battle map, showing exactly that one orc encampment or dark cave. All your adventures, big and small, will tie together into a campaign. The campaign in the base game – we all know there’ll be expansions, right? – is the Bones of Arnor and has fourteen missions that will not be the same when you play the campaign again. How different each play-through will be from the others, though, is impossible to tell. Asmodee Germany announced the tenth case for the brave agents of the T.I.M.E. Agency. In the new T.I.M.E. Stories scenario Madame players visit the time of King Louis XIV of France. A bit early for the revolution, fortunately. We don’t know what’s going on, but apparently something feels strange. I’m guessing that means the next, big twist in T.I.M.E. Stories‘ overarching metaplot, and I can hardly wait. Coming soon from Bankiiiz Editions is the light drafting game Mu. You have a 3×3 grid to fill with buildings cards you draft. Your goal is to have the most strength in rows and columns at the end of a round. Your buildings are obviously important for that, but when placing them you also want to keep an eye on the resource symbols on those cards. They have half a symbol on each edge, and when they match with adjacent cards to make complete symbols you gain resources to power your project cards and their useful special abilities. A game of Mu should take around half an hour, but it’ll be half an hour of making fun choices. Aaaah, the good, old days of playing beat ’em up games all afternoon after school. My favorite was always Street Fighter on my SNES, and I’m not ashamed to admit it. For those of us who didn’t keep up with the genre Plaid Hat Games are working on a boardgame simulation of 16 bit button mashing. Literally button mashing, because driving the action in Super Punch Fighter are your button cards. You can press all the buttons you want, but any that you can’t reactivate at the end of your turn you must discard forever. Chain buttons together into powerful combo attacks to require fewer activations. That sounds like my old strategy of pressing all the buttons and hoping for the best isn’t going to work. 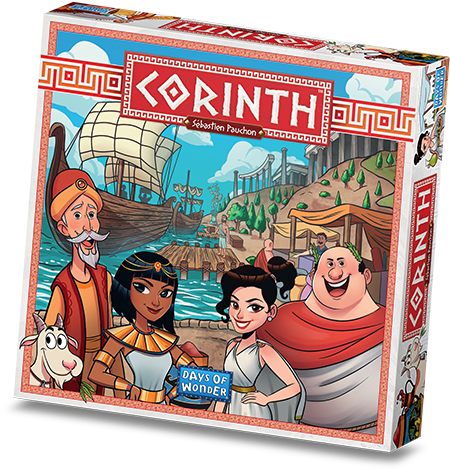 Corinth by Days of Wonder and Sébastien Pauchon (Yspahan, Metropolys,…) is what you might call a roll-draft-and-write game. One player rolls all the dice and splits them up by value. Then players take turns picking up all the dice of one value and taking the action associated with that. Taking gold for the most valuable dice, taking goats for the least valuable, visiting different market stalls in-between. With gold you can buy extra dice or buildings with handy bonus powers.